A few hours before last night’s 247th GOP Debate (the first without Dr. Ben Carson, which will free up an additional 30 seconds of time for the remaining candidates to divide), former presidential candidate Mitt “It Would Be Rude To Bring Up Benghazi” Romney took to the airwaves to attack current GOP frontrunner Donald “Flaccid Fingers” Trump. 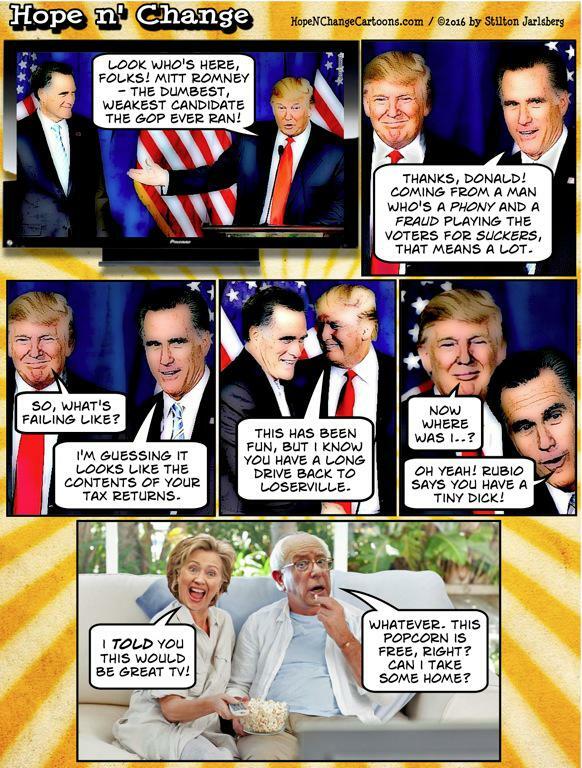 Romney, using language stronger than any he ever aimed at B. Hussein, accused Trump of being “a phony” and “a fraud” whose “promises are as worthless as a degree from Trump University.” Romney added that Trump would be an economic disaster, throwing us into recession, initiating trade wars, and driving businesses and entrepreneurs from our shores. Because it’s really the Democrats who are getting all of the benefit out of the flame wars and food fights occurring between the GOP candidates and the elite and powerful party puppet-masters. Granted, it’s not unusual for the GOP to shoot itself in the foot at election time. But perhaps a ban on using automatic weapons to do so might be worth considering.